However, Treaty 6 chiefs aren’t sold on the child welfare legislation, condemning the federal government for not getting free, prior and informed consent from First Nations. They say the proposed legislation is an extension of the Rights Framework that the federal government claimed to have shelved after vocal opposition from First Nations leaders. "The (child welfare) bill does not meet our peoples and Nations standard to break the cycle and is not in the best interest of First Nation's children," said Ermineskin Cree Nation Chief Craig Mackinaw. The bill also fell short in that it did not include funding to implement the changes, pointed out Cindy Blackstock, executive director with First Nations Child and Family Caring Society. “I was hopeful that we would actually see (funding) in the budget, but there’s nothing in the budget. So that leaves it as an open question to how can we actually make these laws a reality on the ground for children?” Blackstock said in a television interview after the budget was tabled yesterday. Blackstock also pointed out that the money targeted under Jordan’s Principle— $1.2 billion over three years —is the government’s commitment to bringing services and programs for First Nations children on reserve up to the same standard as their non-Indigenous counterparts and is in keeping with an order from the Canadian Human Rights Tribunal. 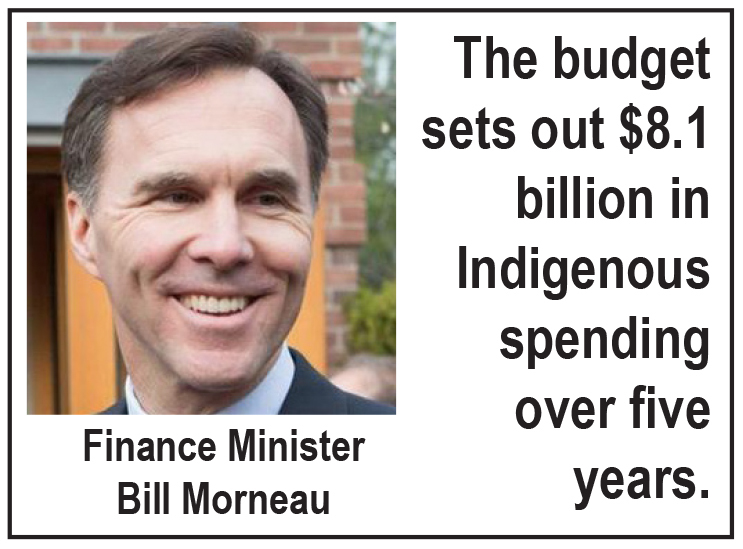 The budget sets out $8.1 billion in Indigenous spending over five years and was lauded by the Assembly of First Nations, Inuit Tapiriit Kanatami and Metis National Council for funding specific to each Indigenous group. All three leaders also acknowledged the roles their organizations played in lobbying the government and advocating strongly to make this financial support happen. “We work hard and collaboratively with the federal government on the priorities under the (Canadian-Metis Nation) Accord and Budget 2019 demonstrates how this work is translated into concrete action and real results for our people,” said Metis National Council President Clement Chartier. Specific to Metis spending is $30 million for Metis veterans and a Metis Nation-led post-secondary education strategy at $362 million over 10 years. “ITK is pleased that Inuit priorities are included in a dedicated section of this year’s budget,” said ITK President Natan Obed. Allocated is $50 million over 10 years for continued implementation of the National Inuit Suicide Prevention Strategy; $125.5 million over 10 years for an Inuit-led post-secondary education strategy; and $220 million over five years for health and social services for Inuit children in remote communities. First Nations Summit commended the government for setting aside $1.4 billion over seven years to forgive outstanding comprehensive claim negotiation loans and to reimburse Indigenous governments that have already repaid these loans. Treaty negotiation debt has left First Nations at a significant financial and economic disadvantage. This debt has also had detrimental economic, social and political impacts on First Nations that have been working to resolve the outstanding land question in BC through treaty negotiations for decades, said FNS in a news release. Other dollars allocated include $9 million over three years to Indspire; $126.5 million in 2020-21 to establish a national council on reconciliation; $333.7 million over the next five years for revitalizing Indigenous languages; $327.5 million over five years to enhance the Post-Secondary Student Support Program while the government engages with First Nations on long-term First Nation-led post-secondary education models; a new Indigenous Growth Fund of up to $100 million for Aboriginal Financial Institutions to support Indigenous entrepreneurs; and $15.2 million over three years for Indigenous youth through the Canadian Roots Exchange program. The federal government also committed more than $1 billion over five years to improve essential services on-reserve, such as clean drinking water, infrastructure, fire protection, emergency response and supports for residents with disabilities or chronic illnesses. However, not every national Indigenous group was pleased with the federal budget’s offerings. The Native Women’s Association of Canada and Congress of Aboriginal Peoples are saying their demographics have been ignored. The exclusion of NWAC and CAP is a common theme that has marked the two national organizations’ relationship with the Trudeau government. Despite having signed accords with the federal government, both organizations have been repeatedly ignored when the government hosts tables to discuss various Indigenous issues. “It is appalling Indigenous women continue to be ignored. This is unacceptable. By ignoring Indigenous women, not only are you restricting reconciliation, but you are breaching basic human rights,” read an NWAC in a news release. The budget did not include any new funding specific to Indigenous women although they were included in $160 million over five years for in the Women’s Program “to advance gender equality in Canada.” The budget reiterated funding committed in 2018 over a number of years for the Multicultural Program to address racism and discrimination. The budget pointed to previous money the government had committed to address the issues raised through the national inquiry, but no new money was forthcoming. That’s not good enough, said CAP National Chief Robert Bertrand. “Through this budget, the government is continuing to discriminate between Indigenous peoples. Our students need support to access post-secondary education, our peoples need access to adequate housing, but instead the government has forgotten them again,” he said.